Quick: take a look at the picture to right. Is it a toy or a candy? Give up? It was a trick question, of course: the product in question is Loratadine 5 mg tablets, also known as Children’s Claritin. And therein lies the problem. Merck and DreamWorks got into some deep water last month for this little merchandising stunt, which saw children’s allergy medication being marketed to kids like something out of a Happy Meal. Characters from the popular Madagascar franchise grace the box cover and promise further tie-ins within, not to mention a delicious grape syrup few kids can resist. 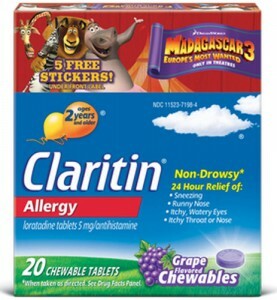 In a complaint filed with the Federal Trade Commission, the Public Health Advocacy Institute and 10 other groups, called the marketing strategy for Children’s Claritin dangerous and deceptive, pointing to the inclusion of Madagascar stickers in some boxes of the product, the creation of activity books that parents can download for their children and the enlistment of a team of mothers who blog to hold Claritin-themed Madagascar viewing parties for their children and friends. 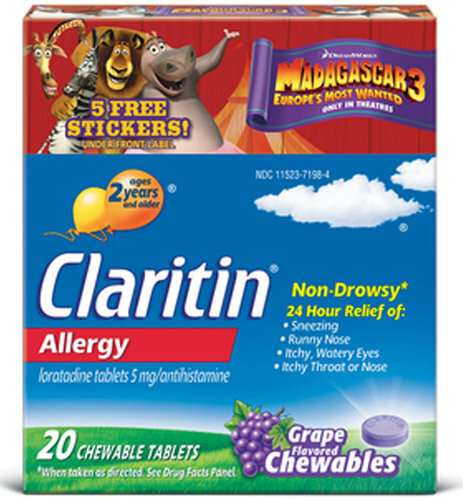 That’s right: Claritin-themed Madagascar parties. Look, I understand that getting kids to take their medicine can be difficult, and I’m sympathetic to any effort that seeks to destigmatize allergies and other chronic health issues. But when those efforts cross the line into venal marketing campaigns which seem intentionally designed to blur the line between drugs and toys, I’m afraid I must object. Surely there must an easier way to keep our children healthy. Maybe this?